Up your breakfast game, and get the kids in on the kitchen action. The Whiskware™ Pancake Art Kit makes cooking creative breakfasts easy, fast, and fun. 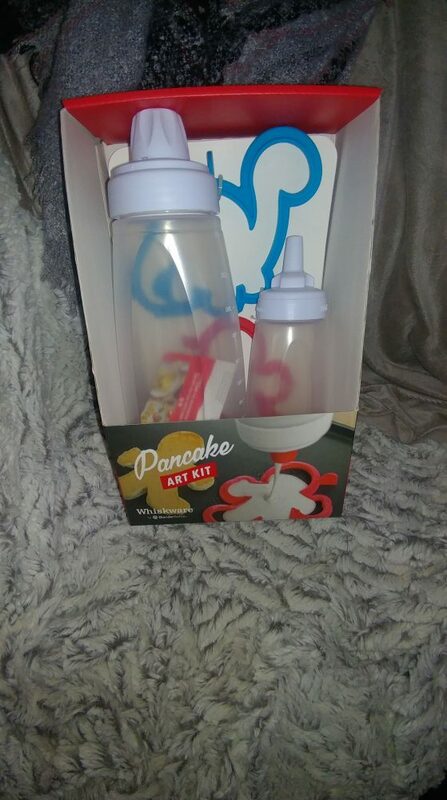 The kit includes the Whiskware™ Batter Mixer, a Pancake Art Bottle, and two individual Pancake Shapers. Breakfast here is always a fun time of day, but usually a really busy time as well. On the weekends I like to branch away from the quick breakfasts and tend to go all out when it comes to making a family meal for all of my boys. Pancakes have always been something we love to eat, but I struggled with making them. I felt like using a traditional bowl and spoon method was just not cutting it. My batter wasn’t mixed enough, the pancakes were either too big or too small and I just ended up feeling so frustrated. Say bye-bye to boring breakfasts with dinosaurs, unicorns, or miniature people on your plate! I also love that Whiskware has an app that I can download called Whiskware Recipe Box with over 100 recipes to try. Easy to clean, easy to use and best of all pleasing for my boys. « Shop Justice for Your Teen/Tween Valentine!